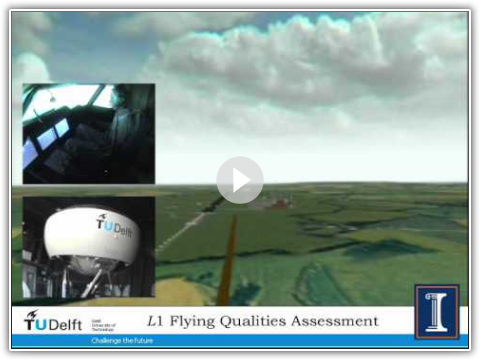 The experiments conducted at the Delft University of Technology (The Netherlands) represent a new effort in the development, flight verification and validation, and technology transition of L1 adaptive control to general aviation aircraft. The main objective of the study was to investigate the ability of an L1 adaptive FCS to provide enhanced handling qualities and maneuverability margins for safe landing in the presence of failures and in different atmospheric (turbulence) conditions. These experiments also represent a first step towards flight testing an L1 adaptive flight control system on the TU Delft’s Cessna Citation II flying laboratory aircraft. SIMONA Research Simulator at TUDelft. The experiments were conducted through piloted-simulation evaluations on the TU Delft’s 6DOF motion-based SIMONA Research Simulator. The study is of particular interest, as it is the first time an L1 adaptive flight control system is tested on a 6DOF motion-based simulator. By adding motion cues and low-latency wide field-of-view visual cues, the evaluation pilots are immersed in a realistic flight environment, enabling them to better assess the aircraft handling qualities with and without failures, as well as its transient responses during the failure in a way that is representative of actual flight tests. In particular, any unwanted transients or highly dynamic control deficiencies that are difficult to observe from pure visual cues can be found through the motion cues. The evaluation task used for the experiments was an offset approach and landing, and three pilots participated in the experiment, all of them with extensive experience as captain on a Cessna Citation. The results of the study suggest that L1 adaptive control is able to maintain consistent aircraft handling qualities in the presence of faults and failures and in different atmospheric (turbulence) conditions. Piloted handling qualities assessment performed on the SIMONA Research Simulator at TUDelft.